Today I'm playing photographer for a local beer crawl, i.e. free beer. Go me. Just what my recently stuffed with food body needs right now. Bring on the heavy carbs! Since I knew I need to be comfortable and somewhat ready to chase people down, I went for a low-key chic grunge look today, a la Cocorosa and Song of Style. 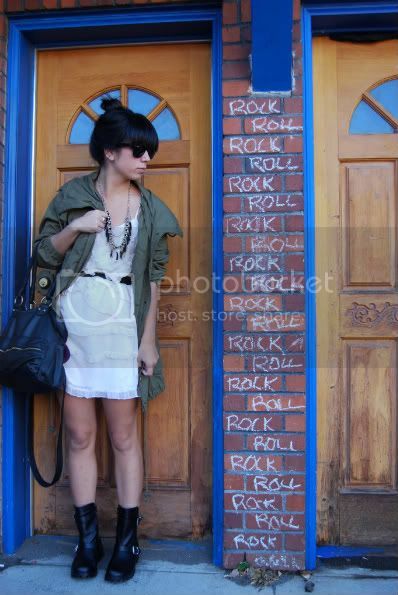 I love how both girls combine such edgy, rocker pieces with flirty, feminine touches. And if all else fails, I can throw on a pair of faux reading glasses and fake it as Daria. Man, who else misses that show?! P.S. Hope everyone's Thanksgiving was fabulous! I just wanted to say thank you to everyone who reads and comments here at This Time Tomorrow. You are all beautiful and make my day! love how you 'roughened' up the soft lace dress! This is a fabulous outfit. 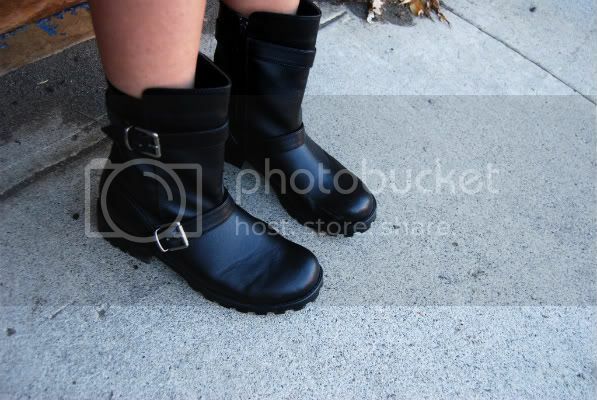 I love the frilly dress with the tough boots. Oh and I miss Daria. I wonder if those episodes are on DVD yet? This outfit is such a perfect mix of feminine and rocker chic. Absolutely love it. Holy crap I loved Daria. She was my muse. Have fun at the pub crawl! tough & feminine, I like! I love the low key grunge look! I too miss Daria all of the time...I used to be so addicted to that show! It's so perfect and I like so much because it become more rock whith this complements! Your jacket pretty much rocks! this outfit is super cute, it reminds me of something I recently saw in InStyle. What a great juxtaposition of soft and hard! Oh my God, Daria! I was just talking about Daria with my fam a couple days ago. I had the most enormous cartoon crush on Trent Lane. 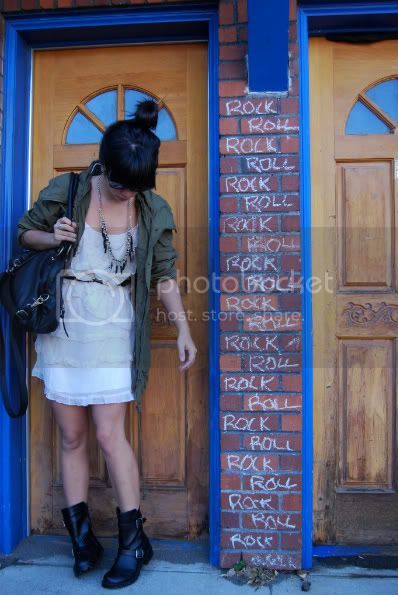 that dress is adorable and you aced the look with the grungy boots! Love the mix&match of this outfit! Are you going to the Santa Pub Crawl? We are going this year and it will be my first one ever. If you have any great pics from yesterdays can you post them? I am not really sure what your job is but it sounds pretty great! I absolutely love those shoes. What a great way to wear them. I really like this, from top to toe! I really like this look - the motorcycle boots especially.